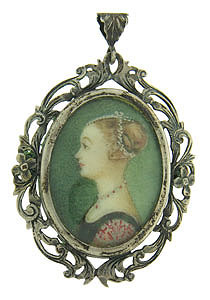 This elegant portrait pin features an 18th century beauty done in profile. Lovely detailed period hair, jewelry and dress are painstakingly rendered. The painting is framed by flowing leaves, vines and flowers, finished with a simple pin back. 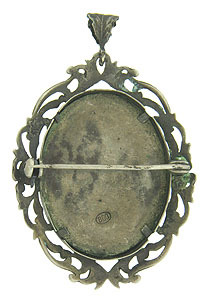 The frame is fashioned of 800 silver and measures 1 3/4 x 1 3/8". 18th century.